Quick Review: Sixteen-year-old Rayna sees angels, and has the medication and weekly therapy sessions to prove it. Now, in remission, Rayna starts fresh at a new school, lands a new job, and desperately tries for normalcy. She ignores signs that she may be slipping into the world she has tried so hard to climb out of. But these days, it’s more than just hallucinations that keep Rayna up at night. Students are dying, and she may be the only one who can stop it. 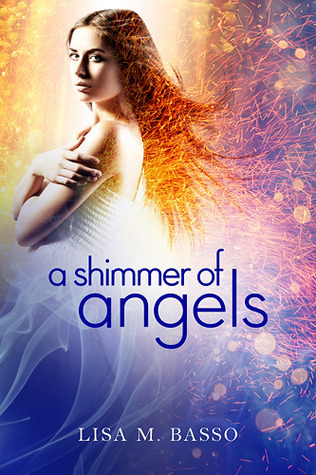 Can she keep her job, her sanity, and her friends from dying at the hands of angels she can't admit to seeing? Detailed Review: When I finished reading this book, my first thoughts were 'Wow, this is just totally amazing.' This book has such a relaxing feeling to it that I feel like I'm out in the park once again, breathing in some fresh air. In other words, this book is original. Nowadays, among mythology, many authors choose angels, or Nephillim, so it's getting quite suffocating with all these angel stuff in your head. But to be honest, I didn't feel like that when I read this book. This book is about a girl called Rayna, who because of her ability to see angels, was considered insane enough to be entered into a rehabilitation center. Nobody knows this but her sister and father, not even her best friend Lee. Her mother died in an accident a few years back. Angels, Rayna was told didn't exist, and she suffered a sickness called schizophrenia, where the 'hallucinations' happened to convinced the patient that the people they loved, who had died was in heaven. Or rather there was such place called heaven. But she wants to start once again. She wants a new life, untainted by angel sightings. She's still in remission but at least she was free from daily therapies. She managed to convince her family that she's changed. That is, until she saw the blonde-haired angel, who also goes to her school, with gleaming white wings that reflect the sun and feel soft underneath her touch. His name is Cam, or Camael. That's when she starts to lose her sanity all over again, and to keep it in check, she writes everything in a notebook. Add another angel with black wings, who feasts on human souls when he's hungry, and she just might as well die. His name is Kade, or Kassade. He's like the bad guy, BUT not quite. The real baddie hasn't shown up. Yet. She finds Alison Woodward, a fellow classmate in Art in a bathroom, with her blood pooling on the floor. You know what happened before that? Alison had drawn an ANGEL without a face but with black wings, with a blue background. And if you're wondering, no it's not Kade. It's Azriel, one of Lucifer's worshippers. Lucifer is the king of the Underworld. I'm sure you should know that by now if you read the Bible. But what he wants are not the students that die under his grip, including Lee, but Rayna herself. She is a weapon to both heaven and hell, armed with the ability to see and locate angels, something that she herself won't even accept. Angels like Cam, the good guys actually can't see the Fallen Ones like Kade or Azriel since they weren't able to see each other's wings. That purpose is to avoid slaughter between both parties when they meet on Earth. Torn between the one that is good and the one that is bad, her confused feelings are muddled as she finds herself attracted to the angels that she has learnt to take from granted when they are actually real. I just think that previous paragraph is really what makes the book good. The unrequited love between Cam and Rayna, and between Kade and Rayna is what will draw our attentions the most, along with the mystery of the deaths of the students in the story. Brief Review: Just amazing. Best Angel book I've ever read. I'd give anythig to read the sequel! This book has brought me to another level of understanding of angels. This book has absolutely shown how much effort the author has put into it. Armed with its own originality and freedom, this book has completely charmed my heart. Honestly, I've never read a book about angels that caught me that much but I really hope I will like this one just as much as you did!